Business Description Welcome to Mike & Ronda's. Located in the heart of Flagstaff just minutes from downtown and across from Northern Arizona University on Historic Route 66 (Milton Road). Mike & Ronda's serves up Flagstaff's finest breakfast and lunch 7 days a week. Mike and Ronda's is home of the freshest biscuits & gravy and creator of the infamous Hungry Man Special. We make the biggest and yummiest cinnamon rolls that are baked fresh daily. There is no better 1/2 lb. burger and fries than at Mike & Ronda's. You will never leave here hungry. 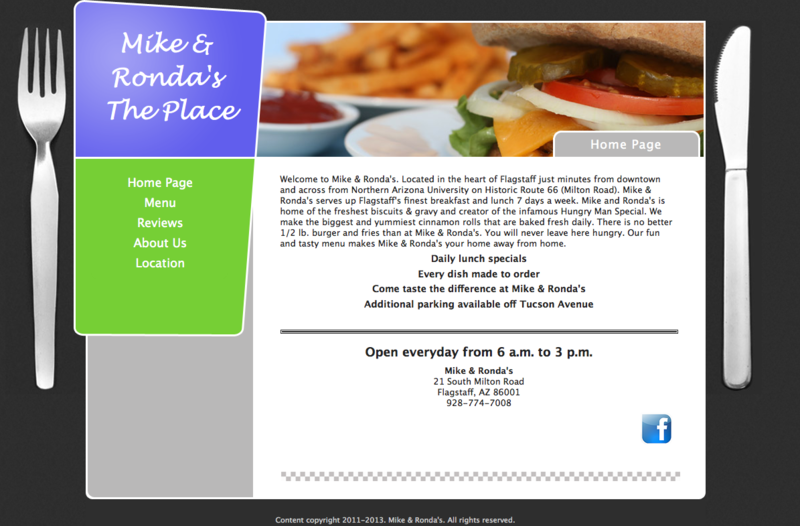 Our fun and tasty menu makes Mike & Ronda's your home away from home.